Ras oncogenes were first discovered almost 40 years ago, when scientists experimenting with what would later be known as retroviruses found that virus taken from a leukemic rat could induce sarcomas in other rodents. Today we know that activating mutations of human RAS are present in ~30% of all human cancers, including both solid tumors of nearly every tissue type as well as hematological malignancies. But despite decades of study and a wealth of knowledge collected about RAS family proteins as well as their upstream activators and downstream signaling effectors, targeting oncogenic RAS has remained elusive. 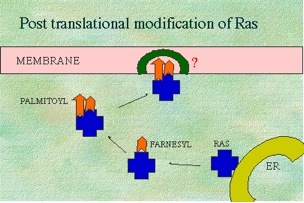 Recently, much effort had been focused on developing RAS farnesyltransferase inhibitors, which target an essential post-translational modifying enzyme which adds a farnesyl-lipid necessary for membrane anchoring to RAS, which is normally tethered to the inner face of the plasma membrane. However, these inhibitors have not been effective as hoped, as a geranylgeranyl-lipid can be alternatively added by another enzyme when farnesyltransferase is inhibited. Targeting both enzymes subsequently proved to be too toxic to normal cells. A recent paper in Blood by Ben Cuiffo, a Molecular and Cell Biology graduate student, and Prof. Ruibao Ren, sets the sights on another post-translational modification: palmitoylation. Palmitoylation serves as a second membrane anchor for some RAS isoforms, allowing them entry to the secretory pathway to traffic from the Golgi to the plasma membrane. The necessity for palmitoylation for oncogenic transformation was previously unclear as RAS signaling scenarios from the Golgi have been characterized in a variety of cell types in culture. Cuiffo and Ren made use of a mouse leukemia model driven by oncogenic N-RAS to drive leukemogenesis in vivo. They found that a point mutation that prevents palmitoylation but does not affect RAS activation was unable to drive leukemogenesis in this model. The finding that palmitoylation is essential for N-RAS leukemogenesis in vivo exposes a potentially powerful new cancer target, not only for N-RAS driven leukemias, but for a variety of malignancies that rely on N-RAS to transduce oncogenic signals.